World-renowned adventure photographer Ace Kvale has done a lot of cool things. He’s dangled from helicopters in the Alps. He’s skied first descents in Alaska. He’s traveled to more than sixty countries and participated in twenty-five expeditions to Asia and the Himalaya. So, when Ace calls something the “Wildest Trek on Earth,” it means something. Enter the Zanskar Chadar Trek. Zanskar is a kingdom in northern India. Originally part of Tibet, and hemmed in by some of the tallest mountain ranges in the world, the region is extremely remote, insanely rugged, and almost entirely isolated from the outside world. Barring the use of a helicopter, (and even that’s dicey), just getting to the place is an extreme undertaking. The mountain passes are too high and snow-covered for efficient travel, and the rivers are too swift for safe, reliable navigation. 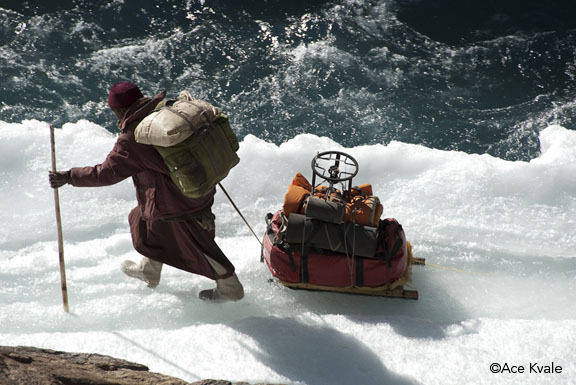 Since no roads lead to the inner reaches of Zanskar, the local inhabitants wait until mid winter for the Zanskar River to freeze over and provide a temporary footpath to the outside world. The route can be treacherous for anyone unfamiliar with the river, with weak ice, frigid water and certain injury waiting around every corner. Yet the locals know the way, having traveled this route for centuries, pulling their wares on sleds, trading butter, and communicating with with their neighbors in Ladakh and Tibet. 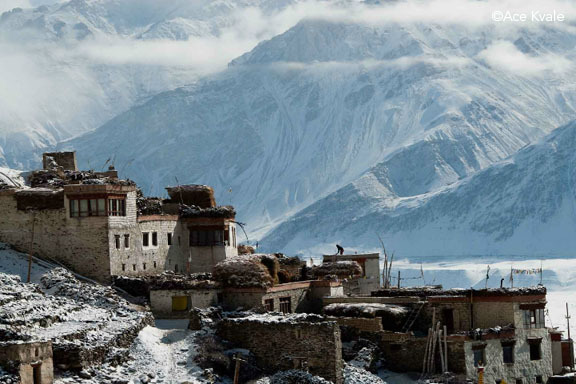 Ryder-Walker’s Zanskar Chadar Trek, is a 25 day itinerary that explores the Kingdom of Zanskar. 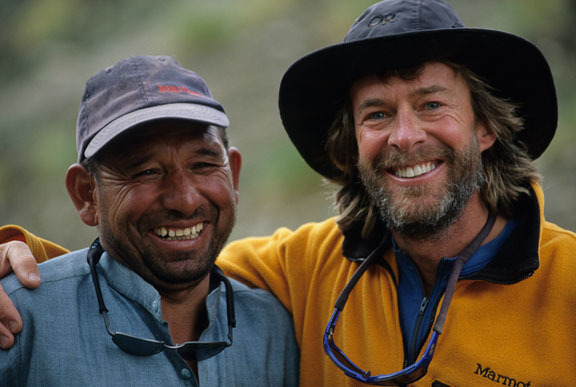 Ace Kvale will lead the expedition, in addition to a team of local guides and porters. We’ll spend half our time hiking along the frozen Zanskar River, and the other half enjoying the treasures of a culture hidden at the top of the world. Since part of the trip follows the river, we’ll spend a portion of the tour winter camping beneath the stars, sleeping in caves, and experiencing the locals’ life as they do what they’ve done for hundreds of years. 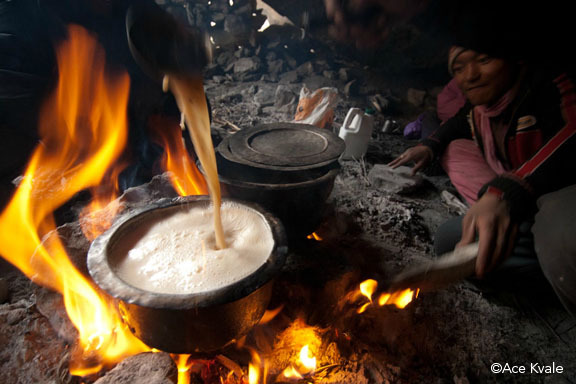 Camp “luxuries” include, hot meals cooked over the open fire, lots of hot water for bathing and drinks and the most delicious chai tea ever prepared over the open flame. Away from the river, we’ll rest in comfortable guesthouses and the nicest establishments of the region, including 5 star accommodations upon the finish our tour. While the route can be tough, the rewards are great. If you’re willing to make the journey to the Kingdom of Zanskar, then you’ll behold a fantasyland of thousand year-old monasteries, exotic animals, and a friendly people seemingly plucked from another time. The river doesn’t freeze as long as it used to. Changing weather patterns have severely shortened the time frame for making this journey. There is a good chance that, in the near future, the river won’t freeze at all. Development pressures are slowly pushing a road into the Zanskar river gorge, forever altering this centuries old route to the kingdom of Zanskar. Opportunities like this don’t last forever. Borders move. Governments change. Things happen. The dates for this tour are January 19-February 12, 2012. Since this is a winter trek, hikers should be prepared for winter temperatures in the mid 30’s F during the day, with lows of -20 F during cold snaps. This is not a trek for people unfamiliar with cold weather camping and less than comfortable sleeping conditions. In addition to high elevation, the time spent on the ice makes the itinerary quite strenuous, taxing muscle groups in ways that many trekkers used to firm and predictable footing may not be used to. The conditions underfoot change hour to hour and day to day, and un anticipatable detours are often necessary meaning that we cannot predict precisely where we will spend each night or in what kind of accommodations. Note: We will only offer this trip in 2012. Please visit our website, then contact us for more details. Click here for images of this trip. Click here for a video of a previous Zanskar Chadar Trek.